Vikrama Simhapuri (presently Nellore town) was part of Vijaya Nagar Empire under the rule of Sri Krishna Deva Rayalu. This place was famous for wicked and cunning women. These women with their uncommon intelligence added to their beauty and appeal used to defeat scholars and experts to transform as their domestic slaves and servants. A prostitute Kanchana Mala among them was too notorious in this regard. In the name of satisfying Ramayana recital, she framed twisty and wicked rules, which made all the competitors lose in their battle against the woman. The ladys reputation along with her condition filled Ramayana recital issue spread all over the region and no one was dared to step into her house to compete with her. In case any one ventured, lured by the stunning beauty of Kanchana Mala they too were definite to lose and become either a slave or a servant to her. “I am aware of those Kanchana Mala! I have a request…” paused Ramalinga. “Please tell me Sir” Mala immediately responded, “Before I complete the total recital you should not say anything. You should do what ever I say as part of the presentation. After I complete the narration you can reward me if you are ‘satisfied’ or punish otherwise” Ramalinga sarcastically stated. She agreed to it and the story began. Ramalinga started with the birth of Rama, Lakshmana, Bharatha, and Sathrughna. It continued with Rama Lakshmana accompanying with Sage Vishwamithra to protect the celestial sacrifice, killing Thataka, releasing Ahalya from curse, Rama’s marriage with Seetha breaking Lord Shiva’s bow, and Rama’s migration to forests along with Seetha and Lakshmana on stepmother Kaika’s wish. Mala started shouting to the top of her voice, “Oh God! Mother! This man is killing me.” Ramalinga in a commanding tone, “I told you not to hinder me in the middle. Now shut your mouth, Listen completely…” jumping like an ape, Ramalinga took out a lighted wisp hanging from the wall. “Hanuman returning from the Ashoka garden after visiting Seetha started torching Lanka and its men like this…” he gave fire to Mala’s clothes and ignited almost all the clothes and inflammables in the house. While Mala was attempting to extinguish fire on her clothes, Ramalinga repeated beating her all over stating that was how Hanuman thumped the demons in Lanka. Mala other than shouting loudly and protecting her from the fire could not do anything. Cursing, yelling, screaming Kanchana Mala said, “fraud, cheat, he said he will recite Ramayana for me and set the house on fire.” With disturbed clothes and hair, she ran to he local Court of Law and approached the judge. She sought justice from the judge explaining the whole episode. Meanwhile, Ramalinga reached there without any tension appearing on his face. The Judge understood that it was the wicked and proud nature of Kanchana Mala, which brought her to this turn of life. 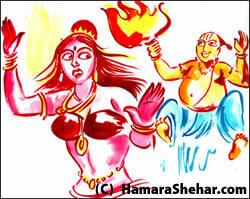 He scolded her for cheating and humiliating scholars and learned persons in the name of Ramayana recital and rewards. The judgement made it clear that Ramalinga did not have any fault to punish and freed him. In addition to this, the verdict released all the learned men who were serving her as servants and slaves. Ramalinga received all the appreciations from the people of the town.